I gave the Raspberry Chia Jam recipe a go and was curious to know if it tasted just as good with all sorts of berries, and yes my friends, blueberries works just as well. I had bought this little pot of raw honey during our visit home (NZ) over Christmas, and didn't really know what raw honey meant or would taste like. Let me tell you, it tastes MILES better than run-of-the-mill super market honey. This brand claims to be a product of happy little bees paying mini visits to local wild flora and fawna, collecting up a different type of honey with each production. If you happen to see this brand in any stores, pick up a jar, I bet you won't be disappointed. See more details here. The jam took 2-3 minutes to make, and I made sure I sterilized my jam jars before storing. I've found no difference between black or white chia seeds. If you don't want them to be seen, then use the white variety. 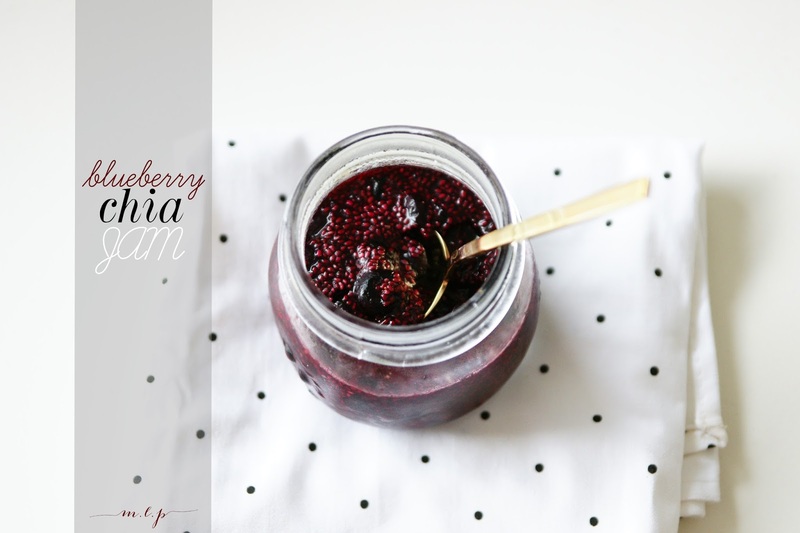 Check out Sarah's original beautiful Raspberry Chia Jam recipe here. 1. In a small saucepan, place your frozen berries, lemon juice and raw honey in a small saucepan. Place this over a low heat, mixing and crushing the berries until the berries have thawed and the raw honey has dissolved. (leave lumps of berries if you like your jam quite pulpy). 2. Take the saucepan off the heat, stir in your Chia seeds and pour the mixture into your sterilised jar. 3. Leave to cool, then place in the fridge for at least an hour to set. The jam should last you up to a week (stored in the fridge) and you can enjoy the jam with any kind of food you like. Here we tried it out on fresh Nutella Banana bread and it was the perfect tangy compliment. I know there are plenty more ways to enjoy Chia seeds than just to bung it in raw in porridge, like, as a pudding, or making a gel out of the seeds and used in place of vegetable oil in a chocolate cake, but for now, I'm going to place a lil pot of this good stuff to dollop on my morning porridge. Happy Monday for tomorrow... or as happy as a Monday can get!